Entrepreneurs, researchers, students and community organizations now have a place close to home to help them make sense of their data with the launch of a new applied statistics center at Truman. The Center for Applied Statistics and Evaluation (CASE), headed by statistics professors Hyun-Joo Kim and Scott Alberts and funded by the Truman Institute, will provide assistance with designing research, collecting data, developing models and providing professional statistical analysis to a range of clients in the community. The Center, which is part of an initiative by the Truman Institute to employ students in services directly related to community needs, will involve talented Truman students aspiring to careers in statistics, working under the watchful eyes of Kim, Alberts and cooperating colleagues. Kevin Minch, director of the Truman Institute, expects there will be high demand for the services of the Center. Clients interested in using the services of CASE can contact Kim at 785.4693, Alberts at 785.7649 or e-mail case@truman.edu. Phi Beta Kappa will host Visiting Scholar Jane Ginsburg at 8 p.m. Feb. 3 in the Student Union Building Georgian Room. Ginsburg, Morton L. Janklow Professor of Literary and Artistic Property Law at Columbia Law School, will present a public lecture entitled “The Author’s Place in the Future of Copyright.” While at Truman, Ginsburg will also guest lecture in two sections of Truman’s Legal Environment of Business class and converse with students in a less-formal coffee gathering. In her public lecture, Ginsburg will discuss the lack of bargaining power that authors have in the copyright system today in comparison to publishers and other exploiters to whom authors cede their rights. Also, Ginsburg will touch on the advent of new technologies of creation and dissemination of works of authorship which challenge traditional revenue models and call into question whatever artistic control the author may retain over her work. Ginsburg holds degrees from the University of Chicago, Harvard Law School and the University of Paris. While at Harvard, she served as an editor of the Harvard Law Review. A summer jazz course in London offers music students a chance to earn credit through a combination of lectures, readings, recordings and live performances in some of London’s jazz and blues clubs. Jesse Krebs, associate professor of music, will lead an informational meeting about the course at 7 p.m. Feb. 2 in the Student Union Building Alumni Room. The course will fulfill the requirements for Truman’s Perspectives in Jazz class. While abroad, students will explore the development of American jazz music and focus on the dissemination of jazz to other parts of the world. The course’s location provides an opportunity to learn from adjunct professors to whom music students may otherwise not have access. Throughout the course, students will have the opportunity to tour Westminster Abbey, see a performance in the Globe Theatre and participate in other social and cultural events included in the course fee. This program is through a study abroad company called CAPA International Education, so students will have access to CAPA’s Computer Lab and the services of a CAPA Coordinator and support staff in addition to visiting faculty from Truman. World Student Health Insurance will also be included in the course fees. To apply, visit http://programs.capa.org/mlpsum11/. This website also includes a brief description of the course. The deadline to apply is March 1. For more information, visit the Truman Study Abroad Office in Kirk Building 114; talk to Alci Arias, assistant director of Truman Study Abroad; or contact Hernando Zambrano, program manager for CAPA International at hzambrano@cappa.org. To see a copy of the course syllabus, contact Krebs at jkrebs@truman.edu or 785.4442. The American Shakespeare Center (ASC) will perform “As You Like It” at 7:30 p.m. Feb. 1 in Baldwin Auditorium. “As You Like It,” one of William Shakespeare’s comedies, tells the story of Rosalind as she flees persecution in her uncle’s court, accompanied by her cousin Celia and the court jester, Touchstone. Actors will perform musical numbers 30 minutes prior to the actual show. Tickets are free and may be obtained in advance at: the Public Relations Office, McClain Hall 101; the School of Arts and Letters Office, Ophelia Parrish 1101; the Information Desk in the Student Union Building; or downtown at Edna Campbells. Unclaimed tickets will be given out at the door. The ASC seeks to make Shakespeare and the joys of theatre accessible to all. At the company’s home in Staunton, Va., the ASC has constructed a re-creation of Shakespeare’s original indoor theatre, the Blackfriars Playhouse, and plans to build an open-air replica of London’s second Globe Theatre. “As You Like It” is sponsored by the Department of English and Linguistics, with additional funding from the Arnold and Alanna Preussner Fund, Truman State University Foundation, New Student Programs, the Theatre Department and the School of Arts and Letters. John Rush, also known as “the Human iPod,” will perform at 7 p.m. Jan. 28 in the Student Union Building Georgian Room. During the show, students can request songs from giant playbooks by writing requests on post-it notes. Students then stick their request sheets on the stage and in between each song, Rush will select three or four post-its for the audience to vote which selection he plays next. The Human iPod plays a mixture of original music and covers, depending on audience response. Rush can play more than 60 hours of music by memory and incorporates seven instruments into every show, including guitar, bass, harmonica, piano, saxophone, keyboard and percussion instruments. Rush uses a loop machine during the show to maintain a full sound usually absent with live soloists. Rush has opened for Matt Kearney, Rob Thomas, Guster, Fuel, Eve 6 and many more. To see multimedia of the Human iPod, visit http://www.houseofwally.com/jr.htm. SUB After Dark is sponsoring this event. Sociology and anthropology students will have three new organizations to join on Truman’s campus by the end of Spring 2011. More than a year ago, the Department of Society and Environment had the idea to start a Cultural and Societal Honors Society. That vision became a reality during Fall 2010 when students Jessica Bernstetter and Katherine Olsen Flaate helped initiate a chapter at Truman and the group inducted 13 members. The honors society accepts all sociology/anthropology majors who have completed at least six hours of sociology/anthropology coursework at Truman with a GPA greater than or equal to 3.0 in this major coursework. In Spring 2011, the same department will induct charter members into two additional organizations, both national honors societies. Alpha Kappa Delta, a sociology honors society, will be open to students with at least 12 completed hours in sociology and a GPA greater than or equal to 3.0 overall and in sociology classes. Elaine McDuff, associate professor of sociology, will be the faculty sponsor for this organization. Lambda Alpha, a national honors society for anthropology, will be open to students with at least 12 completed hours of anthropology and a GPA greater than or equal to 3.0 both overall and in anthropology courses. Amber Johnson, associate professor of anthropology, is the faculty sponsor. Students interested in learning more about the Cultural and Societal Honors Society, Alpha Kappa Delta or Lambda Alpha should contact Johnson at ajohnson@truman.edu or McDuff at emcduff@truman.edu. 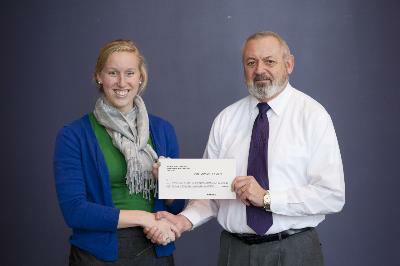 Dani Steele, student chair for the United Way Drive, accepts a donation from Dennis Markeson, director of dining services. The donation came from money raised during the Food Fast campaign. Students donated meals and dining dollars during the first week of November with student advisers and Sodexo staff playing an important role in promotion. Sodexo was able to present a check for more than $8,380 to the United Way, the highest amount ever raised by the Food Fast campaign. On behalf of the United Way of Adair County/Northeast Missouri, campaign co-chairs Joe Hamilton and Tony Vazzana would like to thank the students, faculty, staff, emeriti and retirees of Truman, as well as Sodexo and its employees, for making this year’s campaign a success. This year, the University surpassed the campus goal of $56,000. 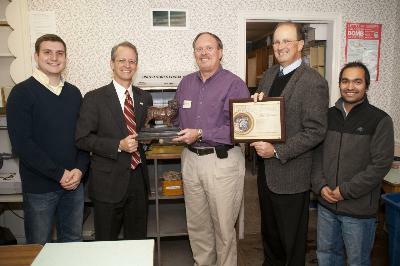 Campus Mail Services received the Bulldog Award last semester. The award, presented every other month, recognizes “shared team achievement” for outstanding customer service practices. Faculty and staff are encouraged to nominate a department that strives to provide exceptional customer service. Supervisors and directors can nominate departments (their own or others) they believe exemplify the best practices in customer service. Nomination forms can be found online at http://hr.truman.edu/recognition/bulldogaward. Pictured, left to right: student Luke Laughlin; President Troy Paino; Roger Marsh, director of Mail Services; David Rector, budget director; and student Ganesh Baniya. This semester, the Global Issues Colloquium will feature three main events to help students think more globally than locally. First, the series will explore “Cultural Perspectives on Plagiarism and Academic Dishonesty in Higher Education” at 7 p.m. Feb. 3 in Baldwin Hall 176. At this event, a diverse panel of international students will discuss ideologies on plagiarism, citing sources and group work in various counties. Concepts of intellectual property in the United States can be a huge cultural stumbling block so Truman’s international students will discuss how they have adjusted to expectations in this country. The next event, “Gods, Guns, and Gandhi: Rethinking Terrorism” at 7 p.m. March 31 in Baldwin Hall 176, will explore how responding to terrorism with violence or war does not always prove successful at destroying terrorist organizations. This discussion will delve into alternative, nonviolent responses that may be more fruitful in the long run based on the roots of terrorism in religion and economics. At the last night of the series, a founder of the Evergreen Cooperative Initiative in Cleveland, Ohio, will present a fresh perspective on how to be economically sustainable at 7 p.m. April 21 in Baldwin Hall 176. Founder Ted Howard will discuss his experiences of this initiative so far, which may serve as a model and inspiration for sustainability efforts elsewhere, including Truman as it seeks to cooperate with Kirksville and Adair County. To register, stop by a sign-up table Jan. 24-27 in the Student Union Building or Violette Hall or register online at http://www.redcrossblood.org/make-donation. Nominate students, organizations and advisers online at http://csi.truman.edu or pick up packets in the Center for Student Involvement Office in the Student Union Building. at 7 & 9 p.m.
Study Missouri, a collaborative project among Missouri colleges and universities, is hosting a photo contest for snapshots taken during students’ study abroad experiences. Attach photos to an e-mail entitled “Photo Contest” and send to StudyMissouriPhotoContest@gmail.com. Students should include: name; whether they are an international or study abroad student; name of their Missouri school; the country where the photo was taken; and a caption of no more than 100 words describing why the photo is significant to them. For questions about the contest, call 573.522.1463. The Career Center will host Career Week Feb. 14-17. A variety of events will help students build networking skills, polish resumes and refine interviewing skills. Career Expo will take place 1-5 p.m. Feb. 16, where students can meet employers from a wide range of industries. All majors are welcome to attend. For additional information, visit http://career.truman.edu or call the Career Center at 785.4353. Student Union Building 10 a.m.-3 p.m.
Career Center 8 a.m.-5 p.m.
Student Union Building 5-9 p.m.
Visit http://career.truman.edu for more information on these programs. Student Union Building 11 a.m.-4 p.m.
Missouri Campus Compact (MoCC) is offering $300 micro-grants for faculty members to conduct course-based service-learning or research during 2011-2012. View the Request for Proposals and download an application at http://missouricompact.missouristate.edu/75746.htm. Applications are due March 1. Contact Baillie Cloyd (bcloyd@truman.edu) with questions, to discuss project ideas or for assistance with the grant application. More information is also available at http://servicelearning.truman.edu. An exhibit featuring banned books is currently on display in the Library Gallery until Feb. 18. A banned book is one that has been removed from the shelves of a library, bookstore or classroom because of its controversial content. A book may be challenged or banned on political, religious, sexual or social grounds. The heart of the institute is a process of mentoring work-in-progress, modeled by the Carnegie Foundation. No more than 28 proposals will be accepted for mentoring/presentation, but all forms of SoTL research and disciplinary foci are welcome. Scholars’ proposals need not address the institute theme; rather, they must answer five questions regarding their SoTL project. For complete application details: http://www.creighton.edu/castl/scholarsapplication/index.php. All proposals must be received by Feb. 3. Fostering transformational learning is about teaching for change, and SoTL serves as a useful lens by which to examine taken-for-granted assumptions and aptly frame an exploration of educational practices capable of transforming traditional, returning, and non-traditional students’ learning experiences, both inside and outside the traditional classrooms and laboratories. The Institute and this year’s theme invite a variety of disciplinary and methodological studies. Consider sharing your work as a scholar. For more information, contact castl@creighton.edu. Still Spirit Awards honor outstanding community members whose actions embody Dr. Andrew Taylor Still, founder of A.T. Still University. These individuals possess a willingness to get involved, an unselfish giving of oneself, an ability to lead others and a desire to enhance the quality of life in the community. The deadline for 2011 Still Spirit nominations is Feb. 25. Submissions can be made online at http://www.atsu.edu/spirit. For questions regarding nominations or the 2011 Still Spirits Awards Dinner and Ceremony, contact Virginia Halterman at 660.626.2544 or vhalterman@atsu.edu. *All racquetball matches will be played at the A.T. Still Thompson Campus Center. Curtis R. Blakely, assistant professor of justice systems, and Alice Walkley, a recent graduate and a current student at Baylor School of Law, have published a paper that appears in the December 2010 edition of L.A.E. Journal (a publication of the American Criminal Justice Association). In their paper, “Bio-penology: The Protean Approach,” Blakely and Walkley analyze prison operations from a biological perspective. Critical to their paper is the pioneering work of scholars at the University of Chicago. These scholars developed the concept of social ecology, which suggests that neighborhoods and living organisms share a number of characteristics in common. Blakely and Walkley adopt a similar approach paying particular attention to institutional homeostasis, anti-social contagions and the prison’s evolution. Ultimately, the authors suggest that through the development and application of innovative and creative practices, the prison can become a more effective institution at breaking the criminogenic cycle. Katie Lakner, a senior music major, was awarded Honorable Mention in the Collegiate Division of the Iowa Composers Forum Student Composition Competition for an original musical composition. Lakner’s musical work, “Character Sketches of the Usual Suspects” for flute, will be performed in May during the annual Iowa Composers Forum conference in Cedar Rapids. Marc Rice, associate professor of music, has been asked to contribute an extensive essay on Dixieland music for the forthcoming “Encyclopedia of American Music and Culture,” through ABC-Clio Press. The four-volume work will be published in 2012. Steve Smith, associate professor of business administration, had his article “Legal Issues Arising from the Healthcare Reform Issue” accepted for publication in the Journal of Leadership, Accountability and Ethics. The School of Health Sciences and Education’s Advanced Placement Teacher Development Institute received the Tourism Event of the Year Award at the recent Kirksville Chamber of Commerce annual banquet for bringing 150 teachers to Kirksville in July 2010. This event combined education seminars and classes during the daytime and social events each evening and familiarized high school teachers from all across Missouri with Truman and the community of Kirksville. Carolyn Cox’s Worksite Health class will host an ergonomics workshop for staff from 10-11 a.m. Jan. 25 and 1:30-2:30 p.m. Jan. 26 in the Student Union Building 3201 to identify injury risks at the workstation. The workshop will include tips to avoid musculoskeletal disorders such as neck/back/wrist pain, a risk assessment check sheet, fun exercises and suggestions for how to rearrange the workstation to optimize safety. The Department of Public Safety will conduct van driving classes at 2 p.m. Jan. 25 and Jan. 26 in Grim-Smith Building 109. This class is required to drive Truman’s full-size vans. The class will last two to three hours. Space is limited, so call 785.4177 or e-mail joycook@truman.edu to reserve a spot. Student drivers must also complete a Waiver of Vehicle Usage Policy form, available at http://police.truman.edu. An informational meeting for a new summer course that includes trips to Yellowstone and Grand Tetons will take place at 7:30 p.m. Jan. 25 in Pershing Building 232. The Society for Social Change will host a peace vigil from 7-7:45 p.m. Jan. 27 outside of Kirk Memorial. Everyone is welcome. ROTC will host the Frostbite Frolic 5K Run/Walk at 9 a.m. Jan. 29. The race starts and ends at Stokes Stadium. Registration forms are available at Baldwin Hall 132, and registration continues until the day of the event. The race costs $15, and all participants receive a goodie bag and a t-shirt. An informational meeting about the 21st Century Women’s Leadership Academy hosted by the University of Missouri-St. Louis will take place at 9 p.m. Jan. 27 in the Student Union Building 3204. This weeklong leadership program will take place May 22-27 and help females build self-confidence, develop leadership skills and allow networking. All majors are welcome. Special Olympics Northeast Area will host a recruitment meeting for organizations from 6:30-7:30 p.m. Feb. 1 in Violette Hall 1308. Interested organizations should send one representative who knows approximately how many volunteers will be available for the event on April 16. The Truman Art Gallery is now featuring Renaissance prints through Feb. 18. This exhibit, “The Workshop and the World,” contains 15th and 16th century prints from numerous collections and was curated by Julia DeLancey, professor of art and art history, with student assistance. Curators will give gallery talks from 12-1 p.m. Jan. 27 for staff and 4:30-5:30 p.m. Jan. 27 for the public. Truman professors who wrote poetry to accompany the gallery will read their selections at 6:30 p.m. Feb. 1. Refreshments will be provided. “4 Real 4 Faux—Animating the Vernacular” will be on display in Ophelia Parrish’s main art gallery now through Feb. 18. The display features artwork by self-taught and academically trained artists that was influenced by outsider art. It was curated by the Truman Curatorial Fellow Naney Mizuno Elliot. The closing reception for this display will take place 6 p.m. Feb. 18.